Massage has many benefits from relieving stress to easing pain from sore or tense muscles. But did you know there are many different types of massage, each targeting different aspects of the benefits of massage therapy? Bungalow Retreat in Florida offers chair massages and full-body massages at your convenience when you join our elite relaxation club. Visit us online today! Swedish Massage. This is the most popular type of massage and probably what comes to your mind when you think of massage. Swedish massage is based on the Western concept of massage, rather than the energy-centered style popular in Asian forms of massage. Lotion or oil is used, beginning with broad strokes on down to specific strokes to your problem areas. Swedish massage is usually a full-body massage and is used to promote circulation, muscle relaxation, and help you when you’re recovering from an injury. Strokes include long, smooth strokes, kneading, circular motions, and shaking movements. Aromatherapy Massage. Most massage therapy centers who offer Swedish massage also offer aromatherapy massage, which, in essence, is just Swedish massage with essential oils added to the lotion or the oils the massage person is using. Essential oils provide a deeper, more custom experience. For example, lavender and rose are known to promote relaxation, while some essential oils are better for energizing and soothing headaches. Hot Stone Massage. 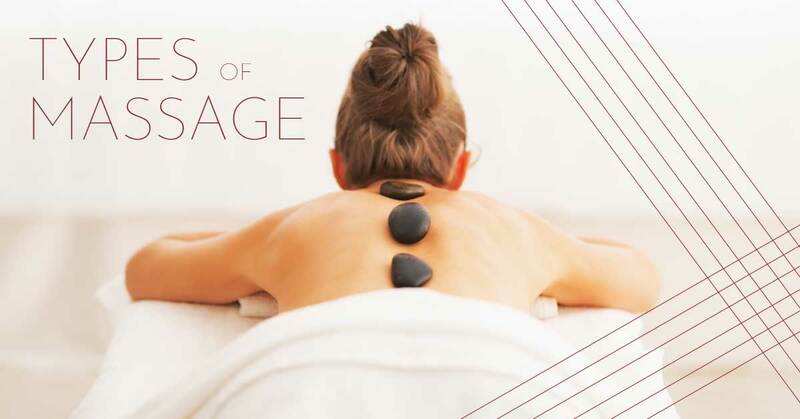 Yes, hot stones are involved in this popular type of massage. Stones are heated and then placed on specific areas of your body, which can help release especially tight muscles. Deep Tissue Massage. Common for athletes, deep tissue massage targets muscle knots (or adhesions) as well as extremely tight muscles and connective tissue. The massage therapy session will be more targeted with slower, deliberate strokes and can be more painful. If you have chronic pain or lingering injuries, deep tissue massage can help. Shiatsu Massage. A massage therapy that originated in Japan, massage is applied by the massage person’s fingers or elbows in a rhythmic sequence and held. This mimics acupressure points with the goal of improving your body’s energy flow and helping to restore your body’s balance within. Shiatsu has many benefits, including reducing stress, helping with arthritis and insomnia, and stimulating the digestive system. No oils or lotions are used in this type of massage. Thai Massage. A type of massage therapy originating in Thailand, Thai massage combines elements of yoga, stretching, and massage. It’s comparable to yoga only the massage person moves you to the position you need to be in. Similar to the effects of Shiatsu massage, you’ll realign your body’s energy, improve flexibility, and reduce back pain and migraines. Prenatal Massage. Pregnant mothers have different needs than other patients. Hence, prenatal massage is geared more towards relaxation and problem points such as low back pain and swollen ankles. Prenatal massage people are trained in how to position and support the expectant mother for safety purposes. Reflexology. Based on reflex areas on the hands and feet, reflexology aims to balance your nervous system and stimulate endorphins to release stress in the body. This type of massage is great for those who sit or stand all day. Sports Massage. Designed to deal with specific problems athletes face from repetitive motions, sports massage manipulates the body’s soft tissues to increase blood flow, range of motion, and increase flexibility, which aids in a faster recovery from such an active lifestyle. Chair Massage. Chair massages focus on the neck, shoulders, and back primarily. Known to be quick, chair massages help to relieve stress and promote relaxation. Bungalow Retreat utilizes chair massages. Bungalow Retreat is your go-to elite relaxation club in Florida. We specialize in erasing the worries and stress of your day by providing a relaxing, inviting atmosphere for you to enjoy. We offer chair massages, full-body massages, and salt therapy sessions, while you enjoy a bite to eat and a drink after a long day at work. A perfect place to “disappear” for a few hours, Bungalow Retreat in Florida offers low-cost memberships at amazing prices. Our lounges are cozy and inviting, a perfect place to either unwind by yourself or have coffee with a friend while you enjoy a relaxing chair massage. Visit us today and see if we’re for you!